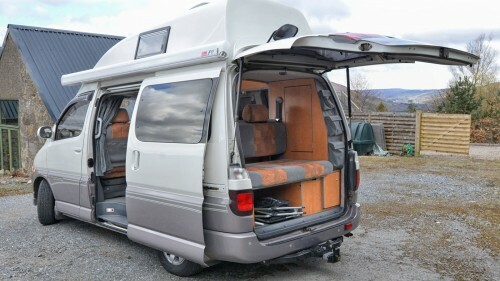 This page displays all the campervans that are available for hire in Perthshire . If you would like further information or to speak to the camper's owner about hiring their van please visit their Camperbug page, by clicking below. I am ColinSilver, hire me today! Colin is a 2-berth campervan. A Wellhouse Leisure converted Toyota Granvia, he\'s similar in size to the classic VW camper with all the same facilities. A 4 feet by 6 feet pull down double bed including a 1\" memory foam topper. A 2-ring gas burner, fridge, crockery, cutlery and pans. Spare gas. Bed linen, towels and down duvet pack available to hire. The van comes with outside table and chairs, a kite, hook up cable, Tom Tom satnav, guide books to touring Scotland, campsite & touring map. Bluetooth radio adapter and USB charger. Thermal mugs etc etc. Bike rack & awning available to hire. The hi-top roof provides two big storage cupboards up top. One for all the bedding, the other takes all your cloths. There\'s also some under seat storage in the rear cab & boot, meaning that all your stuff gets stored away leaving the van clutter free. We use the van regularly so it\'s equipped with everything that we need, for a comfortable 2-person campervan holiday.